This name uses Spanish naming customs: the first or paternal family name is Santana and the second or maternal family name is Araque. Santana was discovered in 1994 by Andres Reiner, who was a scout working for the Houston Astros at the time. Santana's parents agreed to let him attend Houston's academy in Valencia. When O’Brien called Reiner and asked if he had signed Santana to a contract, Reiner reported that he was still deciding if Santana was a better prospect as an outfielder or a pitcher. After six weeks of training, Santana was told he was going to pitch. Santana did not like it and almost left, but Reiner convinced him to stay. While originally a center fielder, Santana was converted to a pitcher at the academy due to his arm speed. In 1999 he was named the Tovar Mérida Athlete of the Year. After the 1999 major league season, he was left unprotected by the Houston Astros and eligible in the Rule 5 draft. The Minnesota Twins had the first pick that year, the Florida Marlins had the second. The Twins made a deal with the Marlins: the Twins would draft Jared Camp with their first pick and the Marlins would draft Santana. The teams would exchange the two players with the Twins receiving $50,000 to cover their pick. 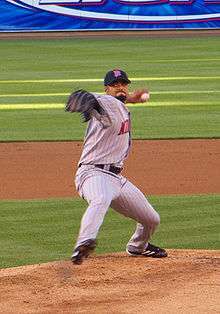 Due to Santana's early major-league success with the Twins, a young minor-league pitcher in the Anaheim Angels' farm system also named Johan Santana changed his name to Ervin Santana in 2003 and has also achieved major league success. Santana underwent minor elbow surgery following the season. In 2004, Santana enjoyed one of the great second halves of modern times. He became the first pitcher since 1961 to give up four or fewer hits in 10 straight starts, and his 13–0 record broke the old Major League second-half mark shared between Burt Hooton and Rick Sutcliffe. Santana finished in good form with a 20–6 record and led the American League (AL) in strikeouts (265), ERA (2.61), strikeouts per nine innings pitched (10.46), WHIP (0.92), batting average allowed (.192), OBP (.249), SLG (.315), and OPS (.564) and walked only 54 batters in 228 innings. Opponents stole just six bases in seven attempts against him, and his 20 victories ranked him second behind only Curt Schilling's 21. He easily won the AL Cy Young Award with all 28 first-place votes. Santana struggled in his first outing of 2005, giving up four runs in the first inning, but quickly regained his composure and returned to Cy Young-winning form in an 8–4 victory over the Seattle Mariners. In his second game, he recorded 11 strikeouts against the Chicago White Sox as the Twins won 5–2. Santana finished the season with an ERA of 2.87, second-lowest in the AL behind Indians pitcher Kevin Millwood (2.86). However, the weak Twins club of the 2005 season cost him several otherwise-winnable games, and his winning percentage fell considerably in his second full year as a starter. He threw 238 strikeouts during the season, leading the majors. He finished third in the Cy Young voting, finishing behind winner Bartolo Colón and closer Mariano Rivera. Santana won the pitching Major League Triple Crown, the first pitcher to do so since Dwight Gooden in 1985. He completed the season leading the majors in ERA (2.77) and strikeouts (245), and tied Chien-Ming Wang in wins (19). He is the first pitcher to win the triple crown with fewer than 20 wins, and the first to win the MLB triple crown with an ERA above 2.60. Santana also led the AL in WHIP (1.00), opposing batting average (.216), and innings pitched (233.2). He continued to add to his reputation as a great second-half pitcher, losing only one game after the All-Star break while winning 10 and posting a 2.54 ERA. A brief slump cost him the opportunity to make his 20th win of the season. No pitcher in Major League Baseball won 20 games in the 2006 season, the first time in modern major league history this occurred. From 2004 to 2006, Santana led the league in strikeouts all three years, in ERA twice, and also led in several other key statistical areas. In this three-year span, he compiled a 55–19 record with an ERA of 2.75 and WHIP of 0.96, while striking out 748 batters. After a slow start, with his record falling to 6–6 at one point, Santana jump-started his season with a four-hit shutout, followed by two wins. On July 1, 2007, Santana was named as a member of the 2007 All-Star Game, his third straight appearance. On June 19, 2007, on the team bus to a game at Shea Stadium, Bert Blyleven said he would have his head shaved if that night's starting pitcher, Santana, threw a complete-game shutout. The Twins won, 9–0, and Santana went the distance on a four-hitter. Santana shaved Blyleven's head the following day. Santana had perhaps his best career game on August 19 against the Texas Rangers in which he struck out 17 batters over eight innings. He walked none and allowed only two hits, both to Sammy Sosa. His 17 strikeouts set a Twins club record for strikeouts in a game. Santana's game score of 95 is the highest by any pitcher in MLB history in a non-complete game. He led the major leagues in home runs allowed (33) and had the most losses of his career (13). Santana finished the season with only 15 wins, his lowest total since 2003. However, Santana led the AL in WHIP, was second in strikeouts with 235, and seventh in ERA. On the last game of the season, a rain delay in a road game against the Detroit Tigers that lasted over an hour caused Santana to pitch only three innings. This ended a 123 consecutive start streak in which he pitched five innings or more. This is the third longest consecutive-game streak for a pitcher in the past half century. In November, it was announced Santana was awarded the AL Gold Glove Award for pitcher, his first selection. He was also honored with a Fielding Bible Award as the best fielding pitcher in MLB. On February 2, 2008, Santana was traded from the Twins to the New York Mets for Carlos Gómez, Philip Humber, Deolis Guerra, and Kevin Mulvey. The Mets and Santana agreed to a six-year, $137.5 million contract. Santana was named the Opening Day starter, throwing 100 pitches in seven innings to earn the win against the Florida Marlins. On May 10, 2008, he earned his first win at Shea Stadium as a member of the New York Mets. On June 1, 2008, Santana earned his 100th career victory, going 7.2 innings and allowing one run in a 6–1 win over the Los Angeles Dodgers. On July 27, the day after the Mets played a 14-inning game where every pitcher in the bullpen was used, Johan pitched a complete game against the St. Louis Cardinals. He struck out five and also got his first RBI as a Met. He won this game, improving his record to 9–7. On August 17, 2008 Santana pitched his second complete game and his 11th win of the season, allowing only three hits while walking none and striking out 7 in a 3–0 Mets win over the Pittsburgh Pirates. On September 23, Santana threw 125 pitches, a career-high to that point, in eight innings to beat the Chicago Cubs. On September 27, in the thick of a playoff race and on the final weekend of the season, Santana pitched a complete game three-hit shutout in a 2–0 win against the Florida Marlins on three-days rest. It was later revealed that Santana had pitched that day, and perhaps in many other starts, with a torn meniscus in his left knee. He underwent successful surgery on it on October 1, 2008. Santana finished the 2008 regular season with a 16–7 record, posting a 2.53 ERA with 206 strikeouts, which set a Mets' single-season record for strikeouts by a left-handed pitcher, breaking Jon Matlack's 35-year record of 205 in 1973. His 2.53 ERA led the majors and was a career best. He also set a career high in innings pitched and was undefeated in the second half of the season. However, he was also the victim of seven blown saves, tying for first in the majors. Santana finished in third place in the NL Cy Young Award race behind Brandon Webb and winner Tim Lincecum. 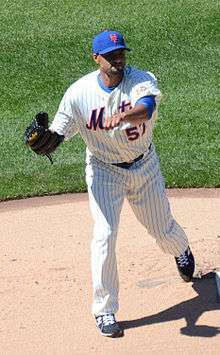 On April 7, 2009, Johan Santana started the first game for the New York Mets in the 2009 season against the Cincinnati Reds. He went 5.2 innings allowing only one earned run, going on to win. In his second start on April 12 against the Florida Marlins Santana struck out 13 batters and surrendered two unearned runs over seven innings only to lose for the first time since June 28, 2008, against the New York Yankees. On August 25 Santana was placed on the 15-day disabled list and missed the remainder of the season after having to undergo season ending arthroscopic surgery to remove bone chips in his left elbow. Santana finished the season at a record of 13–9 with a 3.13 ERA. In 2009 he was named # 3 on the Sporting News' list of the 50 greatest current players in baseball. A panel of 100 baseball people, many of them members of the Baseball Hall of Fame and winners of major baseball awards, was polled to arrive at the list. In a start on May 2, 2010 against Philadelphia, Santana gave up 10 runs in 3 2⁄3 innings, the worst start in his MLB career, surpassing his previous worst start on June 14, 2009 versus the Yankees, where he allowed nine runs and nine hits in just three innings. However, in the next five starts after that, Santana gave up only seven earned runs, striking out 21 and improving his record to 4–2 with a 3.03 ERA. Santana hit his first major league home run off of Matt Maloney of the Cincinnati Reds on July 6, finishing the game with a complete game shutout. From July 1 – 23, Santana was 3–0 with a 0.71 ERA in five starts. Santana, who was struggling to keep his 10–9 record through September 2, strained his pectoral muscle in a 65 pitch start versus Atlanta, for the second time in his career. His last game of the season was a win against the Atlanta Braves on September 2. On September 14, he underwent surgery to repair a torn anterior capsule in his left shoulder. Santana ended his season with a record of 11–9 and an ERA of 2.98. This was the third consecutive year that Johan had gotten injured. Johan Santana missed the entire 2011 major league season while he recovered from his shoulder surgery, pitching only in the minors. Santana in his return to the Mets. On April 5, 2012, Santana was tabbed as the Mets Opening Day starter. This marked the first time Santana pitched in the majors since September 2, 2010 when he tore the anterior capsule in his left shoulder. He went five scoreless innings against the Atlanta Braves, striking out five batters. On May 26, Santana pitched a complete game shut-out against the San Diego Padres, the ninth of his career. He struck out seven over nine innings and improved to 2–2 with a 2.75 ERA over his first 10 starts. Then on June 1, Santana pitched a no-hitter against the St. Louis Cardinals. After a few starts on July 21, Santana was placed on the 15-day disabled list by the Mets after spraining his right ankle. Santana was again put on the 15-day disabled list with inflammation in his lower back on August 22. He did not pitch for the remainder of the 2012 season. Santana finished the season 6–9 with a 4.85 ERA and 111 strikeouts in 21 starts and 117 innings pitched. On June 1, in only the 11th start since returning from shoulder surgery, Santana threw a no-hitter against the St. Louis Cardinals, the defending World Series champions. This was the first no-hitter in Mets franchise history, coming in their 51st season and 8,020th regular season game. It marked only the eighth no-hitter in MLB history against a defending World Series champion team, the first since former Met Nolan Ryan blanked the Oakland Athletics in 1990. Santana walked five batters, recorded eight strikeouts, and lowered his season ERA to 2.38. He also threw a career-high 134 pitches, and earned the new nickname "No-han". Notable moments in the game included a liner in the sixth inning by former Met Carlos Beltrán, which hit the foul line behind third base but was ruled foul. In the seventh inning, Mike Baxter made a difficult catch in left field, preserving the no-hitter, and then violently crashed into the wall. He left the game with a bruised left shoulder and was subsequently placed on the DL. For throwing the no-hitter, Santana was named National League Player of the Week for the week ending June 3, 2012. It was his fifth such award and followed his teammate R.A. Dickey who won it the prior week. His pitching feat earned him the Key to the City, which was bestowed by Mayor Michael Bloomberg. Santana re-tore his shoulder capsule during early 2013. His surgery was performed on April 3, 2013, by Dr. David Altchek. He missed the entire 2013 season amid questions about if his career would continue. On November 1, 2013, the Mets bought out his 2014 option, paying Santana a $5.5 million buyout to avoid being responsible for a $25 million option for 2014, making Santana a free agent. On March 4, 2014, he signed a minor league contract with the Baltimore Orioles, that included an invitation to Major League spring training. He would earn $3 million if he were to make the Major League roster. On June 2, the Orioles selected Santana's contract from the Triple-A Norfolk Tides and placed him on the disabled list. On June 6, Santana tore his Achilles tendon during an extended spring training start and missed the rest of the 2014 MLB season. He became a free agent after the conclusion of the season. On February 26, 2015, Santana signed a minor league contract with the Toronto Blue Jays. The contract would have paid him $2.5 million if he made the 25-man roster, and included bonuses for active days and games started. He started the season on the disabled list of the Triple-A Buffalo Bisons, while rehabbing the shoulder muscles in his throwing arm. On April 23, it was reported that Santana planned on staying with the Blue Jays organization past his April 28 opt-out. On June 27, Santana announced that he was ending his 2015 season due to a toe infection, and plans to resume his comeback in 2016. Santana began the 2016 season as a free agent. In April, MLB Network's Jon Heyman tweeted that Santana was eyeing a "mid-year comeback". On May 11, 2016, his agent, Peter Greenberg, stated in an interview with Venezuelan radio show Los Cronistas that his client would aim to pitch in the majors during the second half of the season. If that didn't work out, Greenberg said, Santana would pitch in the Venezuelan Professional Baseball League. Santana's pitch repertoire includes an 88–94 mph fastball along with a circle changeup, generally considered his best pitch, and a slider. It was reported on February 25, 2014, that Santana's fastball velocity had dropped to 77–81 mph after his second left shoulder capsule surgery. As a child playing in Little League, Santana wanted to play shortstop until coaches told him he couldn't play shortstop because he was a lefty. He then taught himself to throw right-handed so he could play shortstop. Santana is the second of five children. He attended Liceo Jose Nucete Sardi High School, where he played center field. He and his wife, Yasmile, whom he has known since he was nine years old, have two daughters and a son. Santana missed the New York Mets' first regular season game at Citi Field due to the birth of his son. He and his family reside in the Miromar Lakes community in Estero, Florida in Lee County. In 2006, he started The Johan Santana Foundation to provide assistance to hospitals and bought new gloves and bats for children in surrounding areas. Also in 2006, Santana, as well as the Minnesota Twins, purchased a yellow firetruck for Tovar's fire department. Santana has held a party the past two offseasons called El Cy Youngazo (the Great Cy Young) which includes a toy drive, musical groups, and beer from Santana's sponsor, Regional. Proceeds from Johan's charity wine, Santana's Select, also support his foundation in entirety. In 2012, the Johan Santana Foundation expanded their efforts to reach the Hispanic community of New York by contributing to Tuesday's Children, an organization that has made a commitment to families impacted by 9/11, First Responders and their families, and most recently, individuals who have lost loved ones to terrorism around the world. Johan contributed $10,000 dollars, matched with $10,000 by the Mets through the New York Mets Foundation, to expand Tuesday's Children programming to include more resources for Spanish-speaking individuals and families impacted by 9/11. In the off-season, Santana uses Florida Gulf Coast University's baseball facility for some of his conditioning work. Fanned former teammate David Ortiz for his 1,000th career strikeout (June 13, 2006). Signed the biggest contract for a pitcher in the history of baseball (February 1, 2008). Threw the first no-hitter in New York Mets history on June 1, 2012 against the St. Louis Cardinals. ↑ "Johan Santana – Mets Ace #57". Johan Santana Foundation. Retrieved June 15, 2012. ↑ Curry, Jack (January 31, 2008). "Scout Listens to His Instincts, Not to His Boss, and Uncovers a Star". The New York Times. New York Times. Retrieved November 3, 2008. ↑ Costello, Brian (February 3, 2008). "Many Twists & Turns In Johan's Journey". New York Post. Retrieved November 3, 2008. ↑ "Twins' Johan Santana: thriving in his role as a starter: since joining Minnesota's rotation at mid-season in 2003, left-hander has developed into club's ace.". Encyclopedia.com. Retrieved November 3, 2008. ↑ "One Johan was enough". OCRegister.com. Retrieved November 3, 2008. ↑ Christensen, Joe (June 20, 2007). "Punto doesn't care where he plays". Star Tribune. The StarTribune Company. Retrieved May 19, 2008. ↑ Bastian, Jordan (November 6, 2007). "AL Gold Gloves show changing of guard". MLB.com. ↑ Thesier, Kelly (February 2, 2008). "Santana trade finalized with physical". Minnesota Twins. MLB. Retrieved February 25, 2013. ↑ "Santana agrees to $137.5M, 6-year contract with Mets". ESPN.com. ESPN.com. Retrieved November 13, 2008. ↑ "Dodgers vs. Mets – Recap – June 1, 2008". ESPN.com. June 1, 2008. Retrieved November 3, 2008. ↑ "Santana, Putz both out for season". ESPN.com. Associated Press. August 25, 2009. ↑ Wolfley, Bob (May 20, 2009). "Braun makes greatest list". Milwaukee Journal-Sentinel. Retrieved September 4, 2009. ↑ Fitzpatrick, Mike (April 5, 2012). "Santana goes 5 innings, Mets beat Braves 1–0". boston.com. Retrieved June 2, 2012. ↑ Bahr, Chris. "Johan Santana throws no-hitter for New York Mets; first in franchise history". SportingNews. Retrieved June 2, 2012. ↑ Puma, Mike (April 1, 2012). "Santana officially Mets' opening day starter". NYPOST.com. New York Post. Retrieved April 1, 2012. ↑ "Johan Santana Placed On 15-Day Disabled List; Is Not Expected To Pitch Again In '12". CBS News New York. Retrieved August 23, 2012. ↑ "Johan Santana Player Bio". MLB.com. Retrieved November 4, 2012. ↑ Marchand, Andrew. "Johan Santana tosses no-hitter". ESPN. Retrieved June 2, 2012. ↑ Simon, Andrew (June 3, 2012). "Mets place Baxter on DL, recall infielder Satin". www.mlb.com. Retrieved June 3, 2012. ↑ "Johan Santana of the New York Mets named National League Player of the Week". Major League Baseball. Retrieved June 6, 2012. ↑ "R.A. Dickey of the New York Mets named National League Player of the Week". Major League Baseball. Retrieved June 6, 2012. ↑ "Johan receives Key to the City from Bloomberg". Mets.com. Retrieved June 26, 2012. ↑ "Mets Starter Johan Santana Set For Season-Ending Surgery On Tuesday". CBS News New York. Retrieved March 30, 2013. ↑ Rubin, Adam (June 14, 2013). "Johan visits Mets at Citi Field". ESPN.com. Retrieved July 3, 2013. ↑ Adam Rubin (November 1, 2013). "Mets buy out Johan Santana". ESPN.com. Retrieved February 25, 2014. ↑ "Baltimore Orioles Agree to Minor League Deal with Two-time Cy Young Winner Johan Santana (Updated)". ↑ "Johan Santana signs with Orioles". ESPN.com. Associated Press. March 4, 2014. Retrieved March 4, 2014. ↑ Adams, Steve (June 2, 2014). "Orioles Purchase Johan Santana's Contract". MLB Trade Rumors. Retrieved June 2, 2014. ↑ Perry, Dayn. "Orioles' Johan Santana to miss rest of 2014 with torn Achilles'". CBS Sports. Retrieved 6 June 2014. ↑ "Blue Jays sign Johan Santana to minor-league deal". Sportsnet. February 26, 2015. Retrieved February 26, 2015. ↑ Davidi, Shi (February 27, 2015). "Blue Jays make health first priority for Santana". Sportsnet. Retrieved February 27, 2015. ↑ Fidlin, Ken (April 7, 2015) Weighted-ball program helps rehabbing Blue Jays pitcher Johan Santana, Toronto Sun. ↑ White, R.J. (April 23, 2015). "Johan Santana sticking with Blue Jays past opt-out date". fantasynews.cbssports.com. Retrieved April 23, 2015. ↑ Liddell, Mackenzie (June 27, 2015). "Johan Santana abandons 2015 MLB comeback bid". Sportsnet. Retrieved June 27, 2015. ↑ "Jon Heyman on Twitter". Twitter. Retrieved 2016-05-13. ↑ Rangel, Henry David (2016-05-10). "Agente de Johan Santana: "Quizá lance en Venezuela este año"" [Johan Santana's Agent: "Maybe He'll Pitch in Venezuela This Year"]. www.meridiano.com.ve (in Spanish). Retrieved 2016-05-13. ↑ Snyder, Matt (February 25, 2014). "Velocity reportedly lacking in Johan Santana workout". CBSSports.com. Retrieved February 26, 2014. ↑ Cancel, Daniel (January 24, 2008). "Santana's Hometown Awaits His Next Move". The New York Times. Retrieved November 3, 2008. ↑ DiComo, Anthony. "Mets, Santana Donate to Tuesday's Children". MLB.com. Retrieved June 19, 2012. Wikimedia Commons has media related to Johan Santana.